I've been watching a series of geocaches in Usery Mountain Regional Park since Spencer introduced me to the Geocaching quest last April. 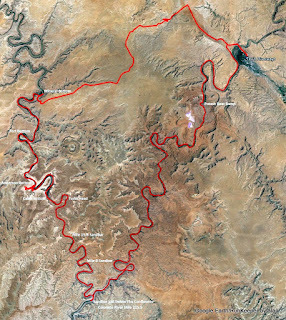 Finally, when BJ got home from her Green River trips, the weather had cooled off enough to make it worth giving the 4 mile long, 27 cache UMRP series a shot. We started early with a heavy overcast and a chance of rain. but we ended up finding all 27 in the UMRP series as well as three others that weren't too far out of our way. Even if you're a newcomer to the park, it's pretty hard to get lost. 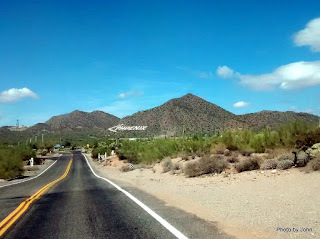 Pilot trainees from local airports during WWII built the Phoenix directional sign, and it's visible from pretty much everywhere in the park. There's still 12 other traditional caches in the park that I haven't found, so we'll be back! When I was growing up, fences were used to keep animals in. Around here, fences are more often used to keep people out. 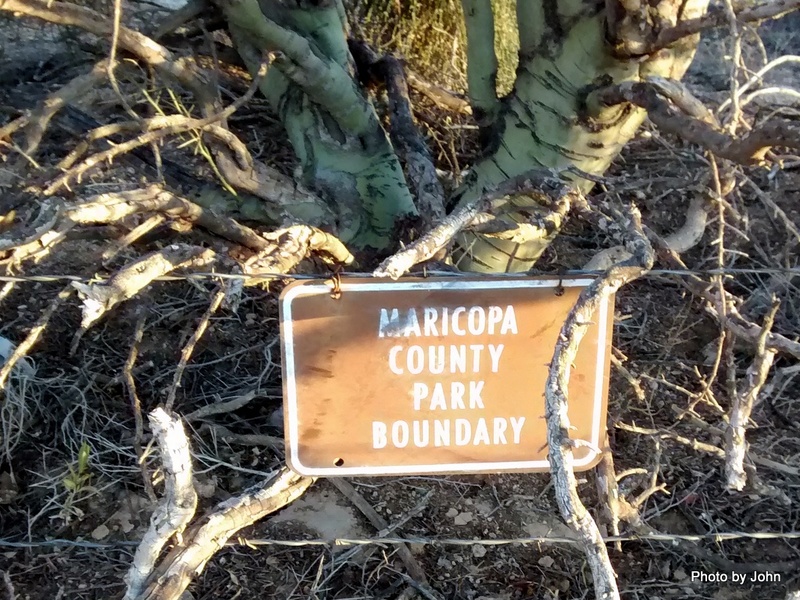 A portion of the Usery Mountain Regional Park border abuts the McKellips Road right-of-way. 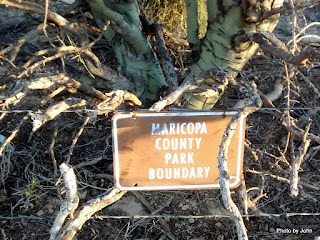 The fence makes sure park visitors, at least the two-legged variety, enter at the corner (and pay the fee,) instead of just cutting across the desert. 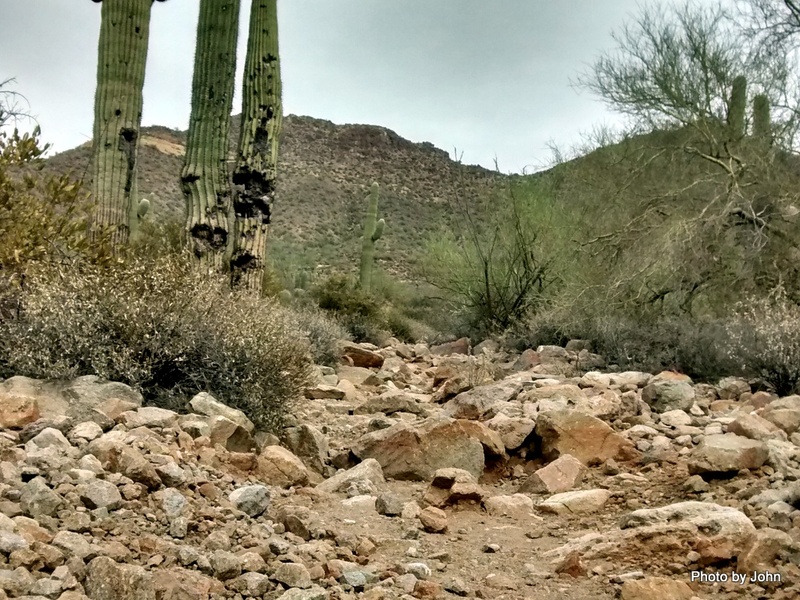 Apache Junction, just to the east, has legitimized a wonderful trail system, leveraging pre-existing trails and old roads through public lands. 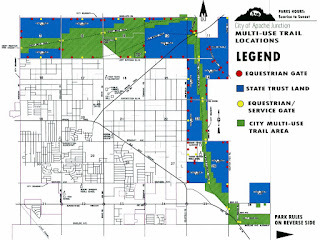 You can travel over 8 miles around parts of the town by horse, bike, or foot. Never know what you'll see. 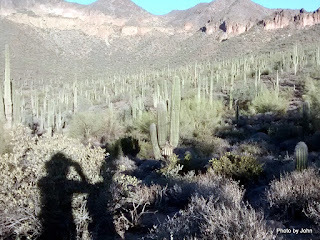 This past week I've been close to coyote, rabbit (not at the same time), and hawks among others. 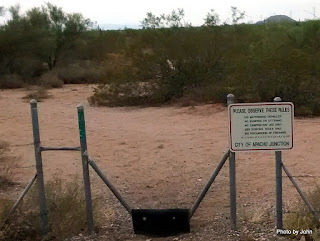 Where their trail system crosses public roads, you'll find horse gates in the fence, along with a sign clearly labeled "City of Apache Junction" with a list of the "play nice" rules. You're left with the impression that there are large chunks of desert to wander, not far from the doorstep. But less than 30 feet from the previous sign is this sign. It's pretty clear that No Trespassing is the subject! 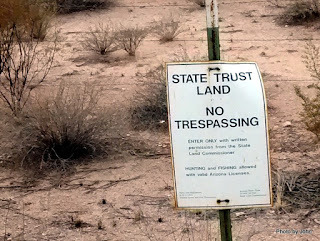 Below that, the fine print says "Enter Only with written permission from the State Land Commissioner." Turns out, for $15 and the proper form, you can get written permission for yourself. For $5 more you can include your family. 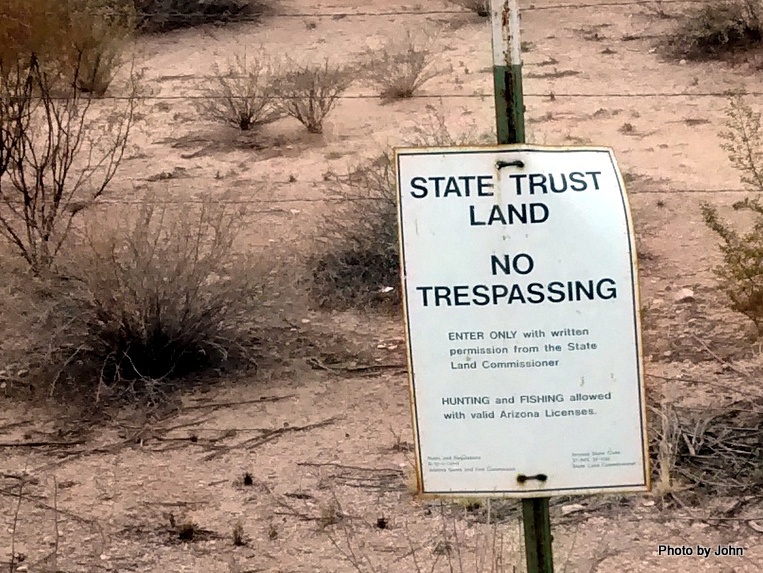 There are no fences between the Apache Junction land and the State Trust Land, and no high resolution, accurate, current map. Guess I'd better invest in "written permission." 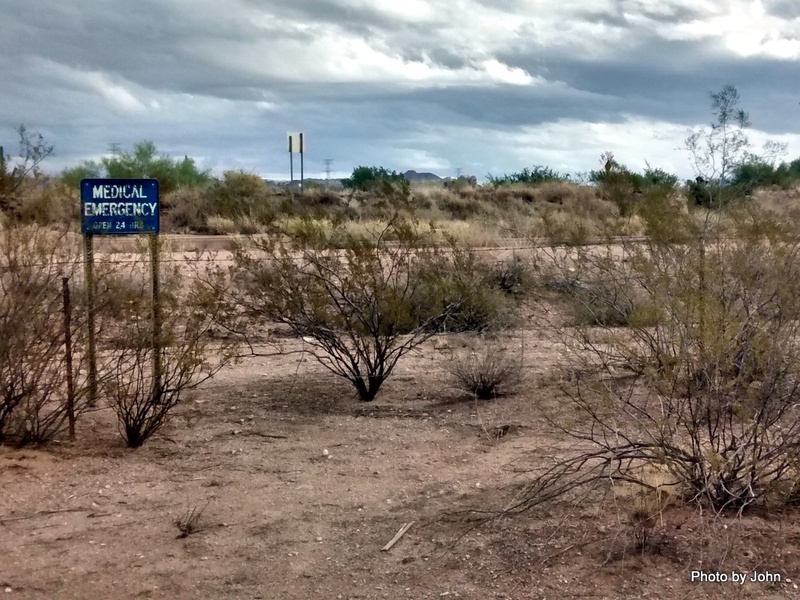 As I was wandering some of the Apache Junction land (at least according to the diagram they gave me,) I ran across this sign. White on blue, clearly reading "Medical Emergency - Open 24 hours." It's posted at a fence next to the Bulldog flood channel. 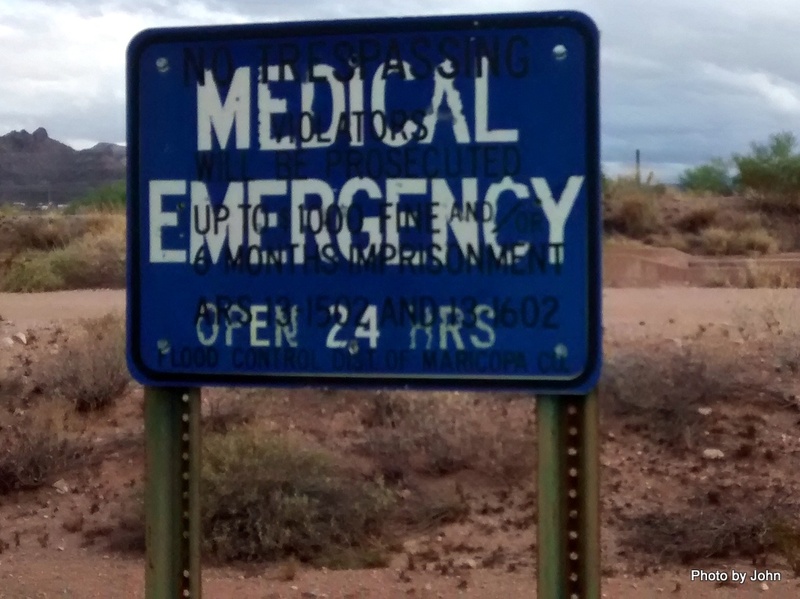 Apparently, the Flood District used a previous sign to make a sign of which only the black lettering remains. The white background that had overlaid the original blue sign is totally weathered away. 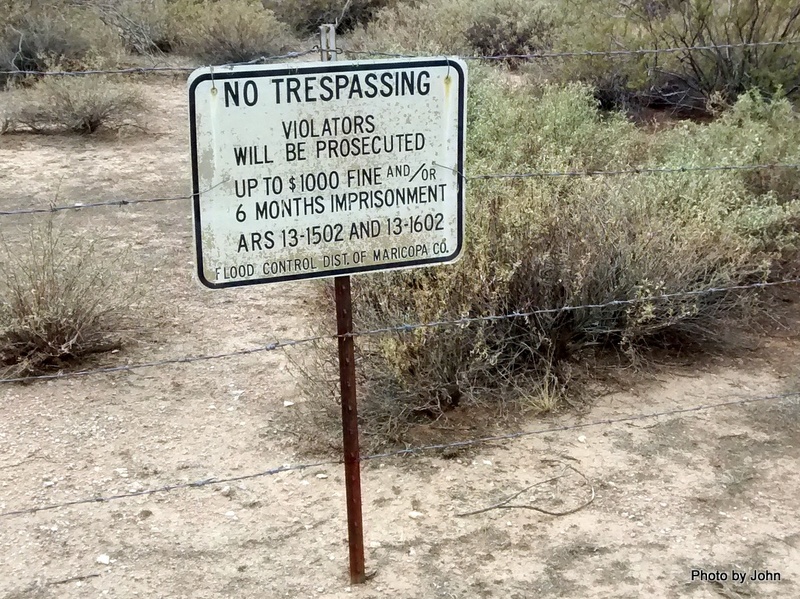 The black lettering says "No Trespassing - Violators will be prosecuted. Up to $1000 fine and 6 months imprisonment." Here's the sign on the north side of the same flood channel. A bit easier to read. 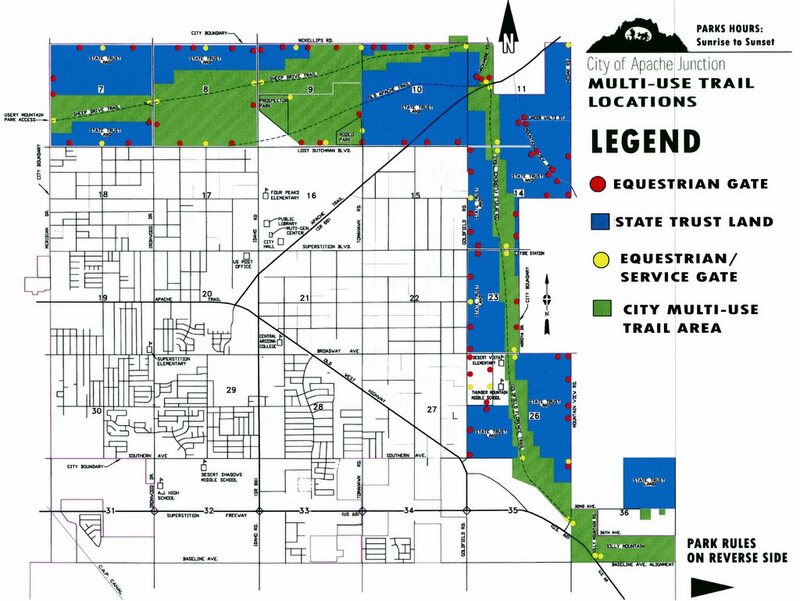 What's interesting to me is that the Apache Junction "map" clearly shows this area as part of their Parks & Recreation system, but the fences and signs suggest otherwise. If I go missing, you might want to check the jail, but I'm not sure which one. Several years ago the doc told me that I needed to walk every day. 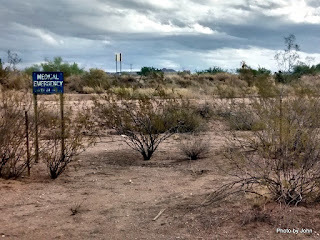 Walking around the block is boring, so now that temperatures are dropping back to sane levels, I've been out wandering the desert, sometimes with BJ, chasing geocaches. For this hike, we headed out to the Meridian Road trailhead and headed up the hill. 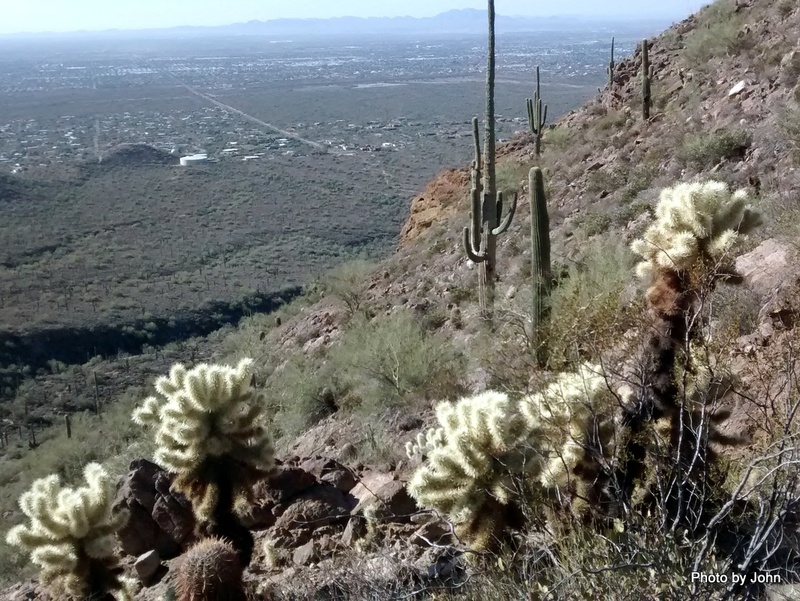 If we'd gone left we could have intersected the back side of the Pass Mountain trail in Usery Mountain Regional Park, but I'm saving that for cooler weather. Instead, we'll work our way up to the top of the pass overlooking Bulldog Canyon. Every walk is different. 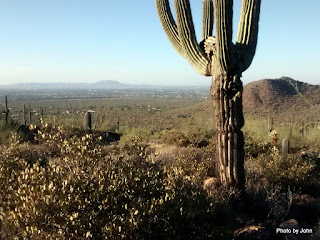 Every trail seems to have Saguaro, and every trail has views. In this case, our view was to the south with Phoenix-Mesa Gateway Airport in the distance. 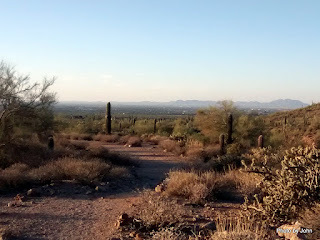 The lower part of the trail didn't have much slope and had a pretty good surface. The upper portion of the trail was much rougher, and steeper. We were going to go to the top and work the caches on the way back down, but when we stopped for a breather the GPS said a cache was 17' away, so we found and logged that one while we were resting. On a clear day you can see forever. On a day like today, not so much. 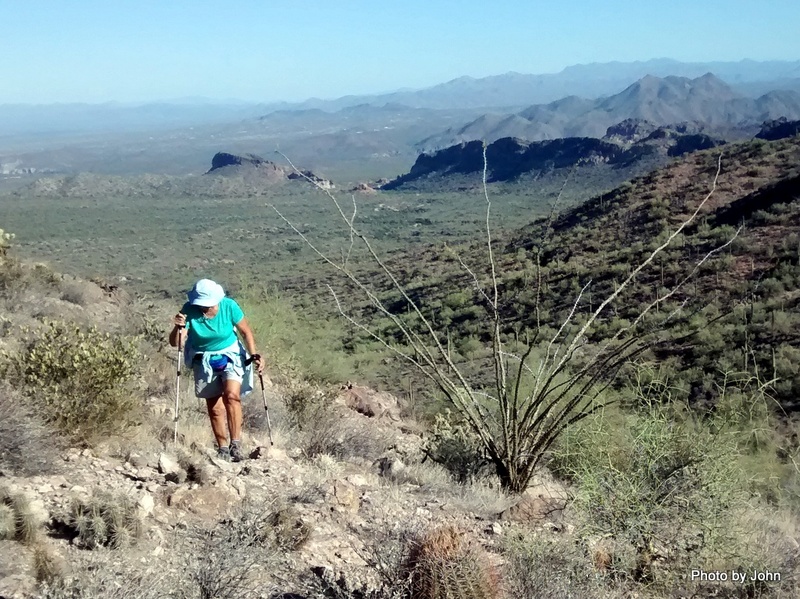 We crossed the pass, and then located the cache high on the east shoulder, coming back through the saddle to locate the cache on the west shoulder. There are lots more caches down there in Bulldog Canyon, but I'll approach those from the Bluepoint access. Seven caches, 4 miles, 800' elevation gain, and fun times with BJ. I can check my walk off for the day. Can't ask for more! 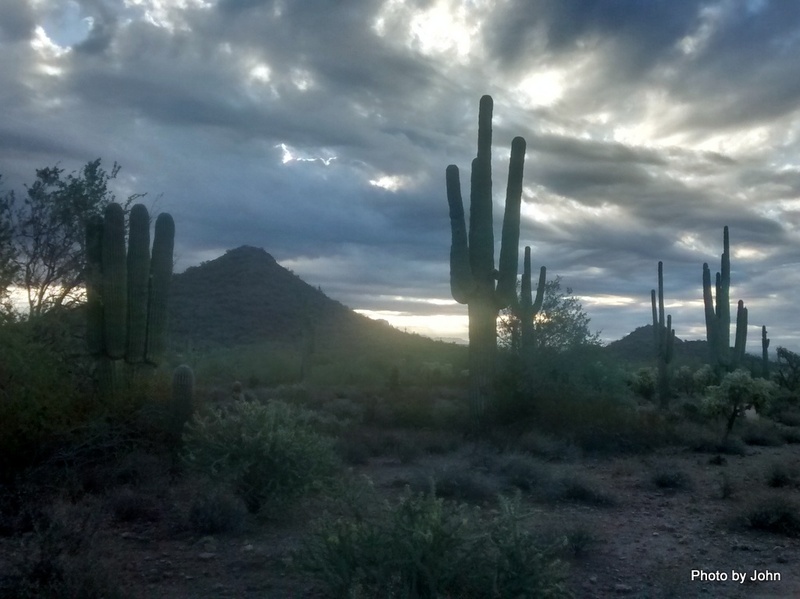 While the river trip was wonderful, Kathy had just one day before she needed to be on a plane out of Phoenix for a business conference. With BJ staying to launch again with her gal friends, I got a ride with Kathy's 5 am departure headed back to the Valley of the Sun. Don't ask me why Alan was up that time of morning to take a picture! The sun was up by the time we got to Monument Valley, so I messed around trying to catch the car & kayak's shadow. Much tougher than I thought it would be! We stopped in Kayenta for a quick bite of breakfast and kept moving. With a significant cross-wind from the left to the right, we headed out of town, but didn't get far. A very loud BANG and suddenly the Knot Too Shabby was alongside of us. 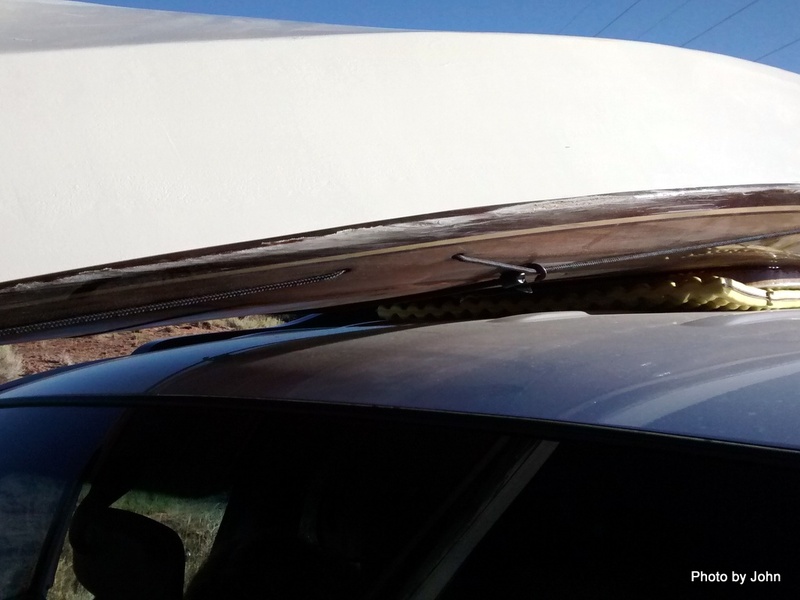 When we stopped, the bow and stern lines were still attached, but the cross bars had bent severely, allowing the cross bars and Malone J-brackets to release from the car. After surveying our options, we pressed my Therm-a-Rest Z Lite pad into service and then loaded the kayak upside down on the roof. The hatch covers had internal tethers. Both hatch lids came loose, and one tether broke, leaving us without one of the hatch covers. 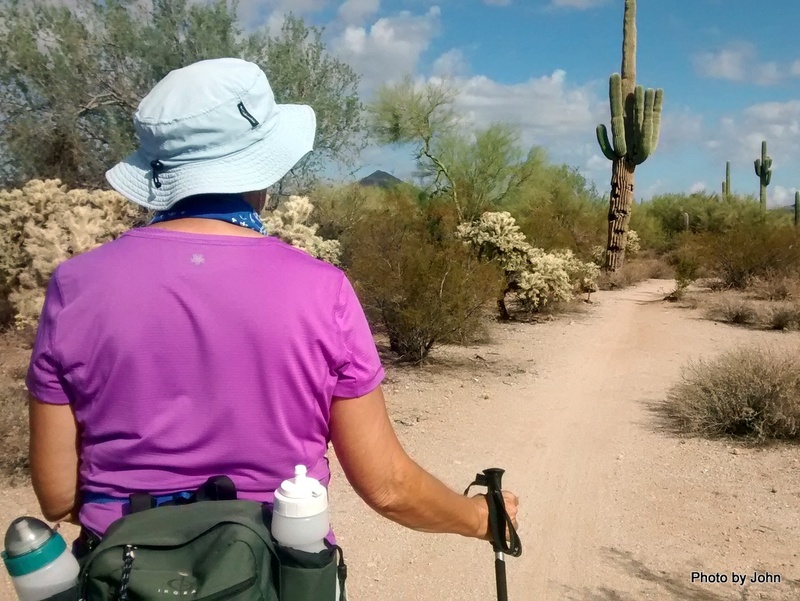 Kathy walked back along the highway and found the missing cover a couple hundred feet back. Both hatch covers have scars but are structurally OK. They'll clean up and the fiberglass repairs will hide any repairs, at least to the casual observer. The boat obviously slid upside down for part of it's E-ticket ride. The cockpit cover was shredded, and a few layers of fiberglass on the front of the cockpit coaming was ground away. 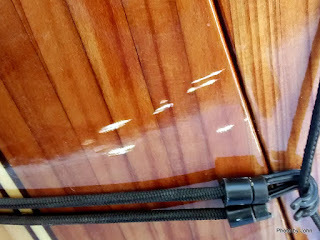 The only other damage on the top of the kayak was the stainless U bolts at the bow and the stern for the carry toggles. The crown of the U bolts were both worn to about half the original thickness. 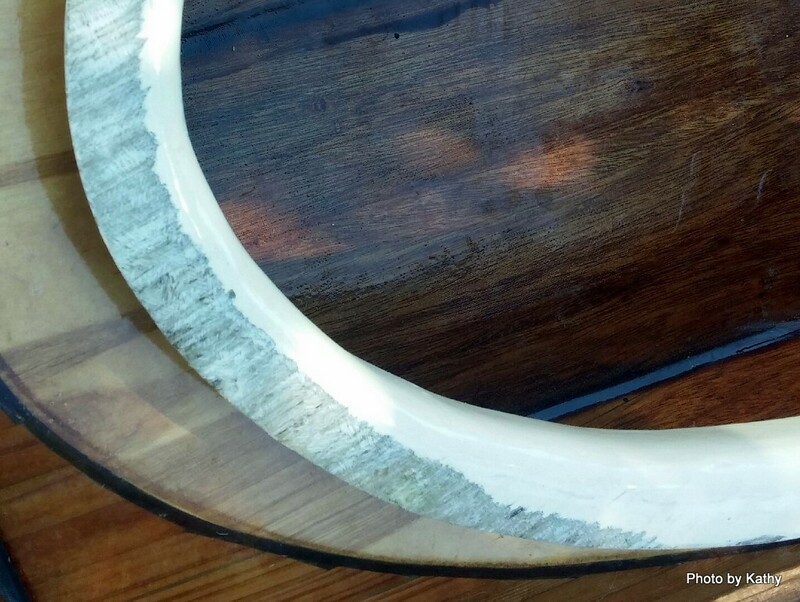 The fiberglass at the deck to hull joint took a lot of abuse. 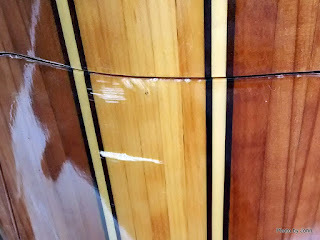 There will be some hours sanding, applying new glass layers, and refinishing, but structurally, the boat is undamaged! Wood boats rock! It will take a few days effort over a couple months to do the repairs and it will be good as new. In the meantime, when Kathy got home with the boat, a note was posted on the boat. "Please let me have some quiet time... I have had a hard day." October 1, 2015 - With the high cliffs on both sides of the river, it took a while for the sunshine to reach us. 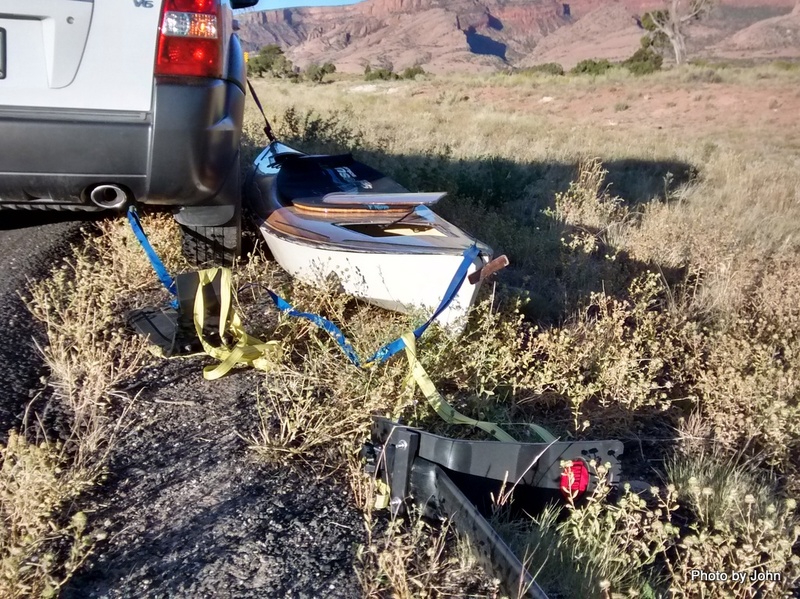 In addition to our gear, a Mother-daughter team brought their gear and canoe over so the jet boat would only have to make one stop. 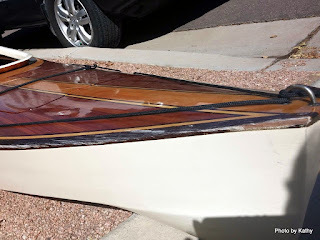 We usually work hard to avoid having any sand on our boats and gear, but with the wind yesterday afternoon, and the boat landing a ways from where the gear was stacked on our large tarp, all bets were off. Still, since everything was dry, it was easy to knock the sand off before loading. Alan got a picture of all the rest of us. In addition to our group, there were three other boat groups and a pair of hikers headed back to Moab on the jet boat. Andy gave his required safety talk before we departed. This was the first return trip where we sat in the most forward seat. Usually, we're looking for a place with less wind exposure. This seat did give me an opportunity for a different camera angle. We saw rafts groups as we normally do, headed down the Colorado to Cataract Canyon and Lake Powell. 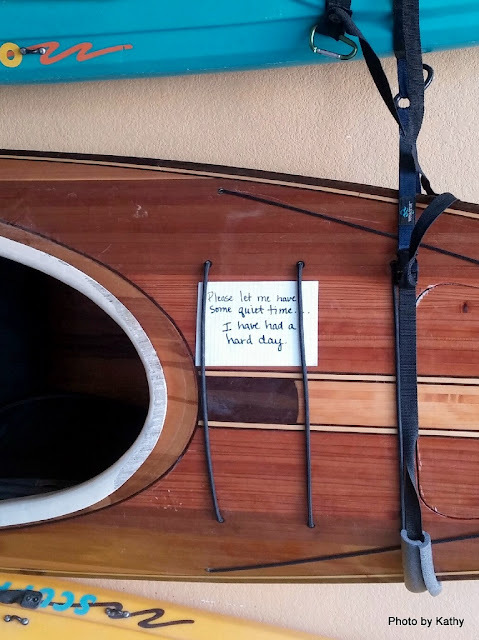 We also saw more canoe groups than normal, touring the flatwater section of the Colorado and then returning from the confluence at the end of their trip on a jet boat. As always, you can click on any picture for a larger version. The views, different yet similar to what we saw on the other side of Canyonlands National Park, were just as beautiful. As we got further north, a breeze kicked up enough texture on the surface to ruin the reflections. 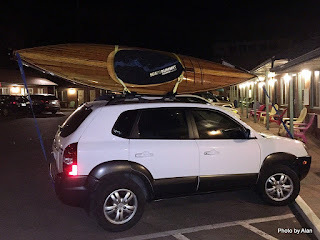 The passengers got off the boat, the boat was loaded onto the trailer, and all of the passengers headed to the yellow limousine for the remaining 20 miles back to Tex's office where we would unload our gear and boats, just like the group I photographed in our Day Zero blog post. Back at the office, some boats were loaded on the appropriate cars while our two went in the rack, ready to be loaded out for BJ's departure for a second trip in a couple days. Some people wasted no time in firing up their phones to see what had happened in the world while we were out of contact. We did manage to get all of us together for one last "river" picture before they moved the boat from the front lot. John & BJ, Kathy, Julene & Alan, and Suzanne. We launched with six and we all came back. Suzanne got her rig reconnected and headed off to her spot. The rest of us headed to the motel where we managed to shower without clogging any drains with Green River sand. One last dinner together and it was time to say goodbye until next time. In my opinion, 9 days was too much for just the Stillwater section. It might have worked with cooler weather where we would have been interested in doing more hiking and where shade wouldn't have been such an important commodity. Without a doubt, this was the warmest Green River trip we've done, but also the only one without measurable rain and without any breezes while we were paddling. 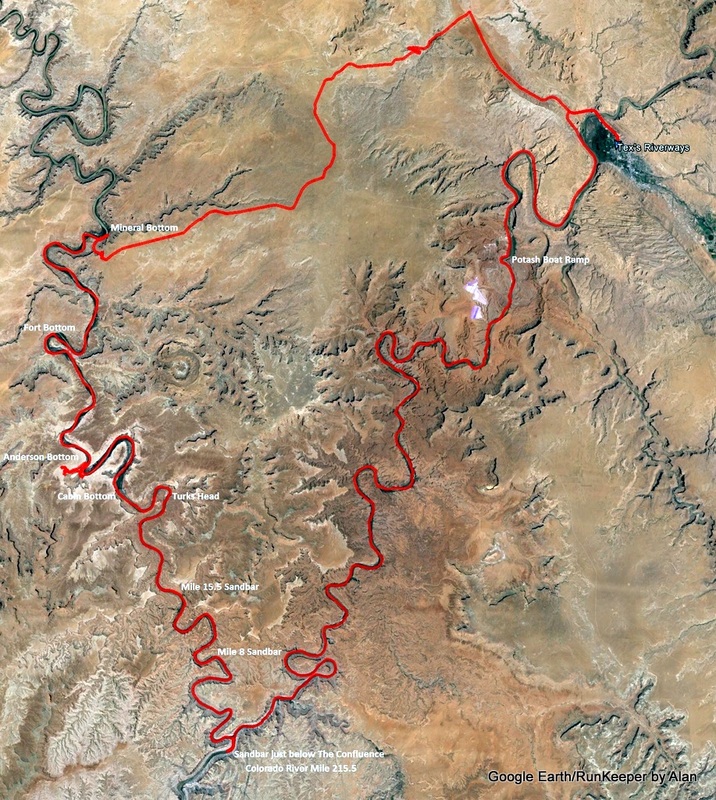 Thanks to Alan and his RunKeeper app we have a complete picture of the trip from Moab (upper right) to Mineral Bottom (upper left) to the confluence (lower left-center) and back. September 30, 2015 - We got up earlier than we needed since we could hear the group that stopped on the low, wet sandbar on the outside of the corner just upstream from our camp. If we're going to hear them up, we might as well get up too. Their camp was confirmation to me of my preference for launching early and making camp early. We had just a touch of breeze, adding a bit of texture to the reflections. Usually, the Great Blue Heron are fairly skittish, but this one hung around letting me get several pictures before it took off. Kathy continued working on her "hard day at the office" pose. We all seemed to line up right down the middle of the river, cutting through the middle of the reflection. Below Water & Shot Canyons, the sun angle was just right to get Suzanne and BJ both right side up and upside down. I was amazed to see a sun dog just before we reached the confluence of the Green River with the Colorado River. I'd heard about these rings around the sun, but I'd never seen one. They're apparently caused by ice crystals in the atmosphere. While this day was the coolest we'd had, it was still pushing 80. The huge sandbar that used to be pretty consist at the confluence on right right wasn't there but there was one on river left at the confluence. We weren't impressed so we continued down the Colorado about 1/2 mile to this large sandbar on river right. We landed near the upstream end where the bank was lower. We got the boats emptied out and cleaned up, but left them in the water since we were using the large tarp for a shade structure. We hadn't seen a ranger when we launched on the trip, and never saw one on the Green. This guy showed up sporting a big wake which dumped chunks of the sand bank in our clean boats. All he wanted to see was that I'd signed the permit as trip leader. All I wanted was for him to wash our boats - again. 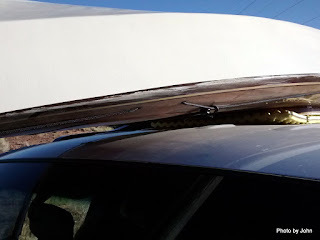 Once the sun moved around enough that we could take down the tarp, we laid the tarp out, washed the boats a final time, and lifted them up onto the tarp to dry. All nice and clean for tomorrow's jet boat pickup - or so we thought. With lots of space to chose from, we ended up with tents scattered down the beach. Everyone was set up and staked down, when a windstorm blew up. Over a week on the river with hardly a breath of wind. Now we have sand blowing everywhere, especially on the clean, still damp, boats. BJ was smart enough to get a picture of her tent before she swept it out. Thirty minutes after it started, the wind quit. We could have washed the boats again, but decided twice was enough. Because of the canyon alignment, we typically don't see much sunset, but Alan did catch some color on the high clouds for our last evening on the river. After dinner, we were kidding Kathy about Ascot leaving her. Just for grins, she called and quickly got an answer. A few more calls and Ascot (or his cousin) was spotted in the tree above us. That made four night that we'd been serenaded by one or more Western Screech Owls on this trip.